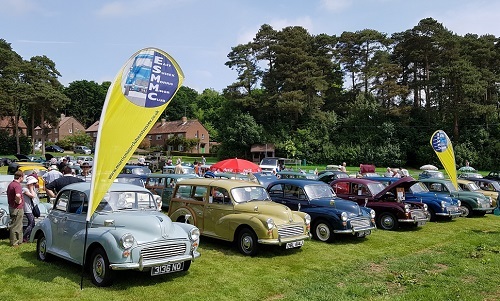 We are once again joining up with Cars on the Common at Staplefield Common, and holding our rally in conjunction with them on Monday, 27 May 2019. This year our rally will cost £2 to attend (this will go to the organisers' charity fund), so please mark the date in your diary and come and support us! Visiting cars (all marques, not just Morris Minors) will be most welcome. Please arrive from 9.00am onwards. If you’ve been to Staplefield previously, you’ll know that there is always a good selection of vehicles there (we will once again have our own dedicated section, just look for the bright yellow gazebo and feather banners) and there is plenty to do in addition to looking at the cars and other vehicles, as there are always lots of stalls, a dog show and other entertainment. Further information can be found on the Staplefield website.